If I was an Alabama fan, sure, I’d be rolling my eyes and saying “get over it” and stuff, and, sure, on the surface, I get that. It was one reversed touchdown in one game nearly 40 years ago. And it’s not like it was some kind of 5th Down, What The Hell? injustice that would would make some Epic Ref Fails! clips show, and therefore worthy of re-re-revisiting. But there are certain aspects that, for a dork like me, for a site like this, keep it in my conversational holster. Simply put, the Gossom Incident affected the entire modern psychology of the rivalry. Here’s what it looked and sounded like. The film is a coaches film we somehow got our hands on. The audio is from the Auburn radio broadcast with the great Gary Sanders, and, ah, what do you know, Gusty Yearout. It cuts in and out to keep up with the video edits–the huddles are deleted–but you get the feel for Gary’s righteous anger even still. And it continues throughout the game, he can’t hide it. And my favorite, which comes at the play at the end of the clip, a Bama player somersaulting in mid-air well after the play is over, his helmet landing in the middle of an Auburn defender’s back, right in front of a ref… so blatant it’s beautiful, really. The Gossom Incident also actually altered the game, i.e. the game of football, or at least that’s the prevailing theory among Thom and his teammates. In 1978, the rules changed. In 1978, the touchdown would have counted. The current ruling says that an eligible receiver can “return inbounds immediately after being blocked out of bounds by an opponent.” Before that, you couldn’t. But did he go out? No one knows. If he did, it was just barely. But even if he did, the call seems super, super suspect, seeing as how it didn’t come from the line judge in position to make the call, in step with Thom from when he touched the ball to when he crossed the goal line. No, the flag was thrown by the backfield judge… 30 yards away. In the middle of the field. He’s the one who threw the flag. Except he didn’t throw the flag. There was no flag. No flag. Just a loss of down, a lot of confusion, and a lot of boos. Here’s how Thom described it in his memoir Walk-On, the research for which, full disclosure and all, I helped with. We’d planned to run the play for a year. We knew Mike Washington, the Alabama cornerback, was aggressive. He’d intercepted the pass a year ago that had gotten me benched. We also knew he would bite on a fake. The ball was set on the hash mark near our bench on Alabama’s forty-one yard line. Coach Barfield [then offensive coordinator] called the play with a formation that would send me into the short side of the field, which wouldn’t leave a lot of room to navigate. I ran the route perfectly. Mike bit on the fake. He was beat and he recognized it. But he wasn’t an All-American for nothing. He made the only move he could. He threw his body at me. He would take an interference call rather than give up a touchdown. I was later told that my big toe came down on the line. I didn’t go out of bounds and come back in. 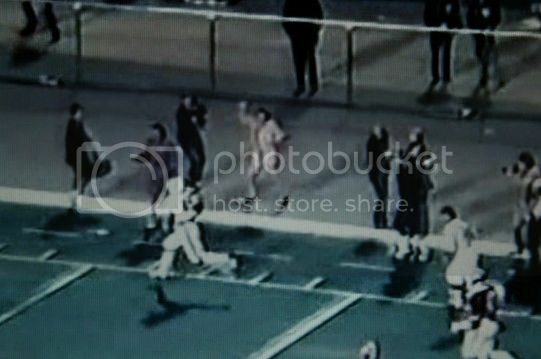 However, there was not a good instant replay angle, which was what make the play controversial. I never saw any film of the play other than the coach’s view from the press box. From that angle you can’t see where I landed. I caught the ball on the dead run. I had only Alabama safety Ricky Davis to beat. I sped down the sideline. Davis steamed across the field. He had the angle. When we met at the ten-yard line, he threw his body across my legs. I gave him the old Rosalind Heights limp leg. He knocked one of my legs into the air, but I came down on my hand and balanced on my other leg. It’s a great photo, one leg in the air, the hand on the ground. Ricky Davis slid past me out of bounds. I ran into the end zone. It was the best catch and run we’d had all year. It was beautiful. We celebrated like crazy. We had new life. Orange and blue pom-poms by the thousands shook all over the stadium The score was 17-13. We began to line up for the extra point. Then confusion broke out on the field. Coach Jordan came out halfway on the field to protest. We followed the officials back up the field to the original line of scrimmage in disbelief. I went from the top of the world to the bottom in a few seconds. We went from euphoria to fourth and four. We didn’t get the touchdown. Nor did we get the interference call. So the air went out of them; Clyde Baumgartner’s 10-yard punt probably didn’t help. But we fought back. Bama didn’t score again. Auburn did. 17-13—again. And that’s the way it ended. We got the ball on the 50-yard line with a minute left. They were going to try the deep ball again. Everyone put their hands in the middle of the huddle and Mitzi Jackson yelled “block, damnit!” It was about to be a movie moment. But then Dubose—Mike freakin’ Dubose, of all people–knocks the ball of Phil Gargas’ hands, falls on it, and ruins the whole thing. Game over. The paper the next day had a picture of Thom streaking down the field. 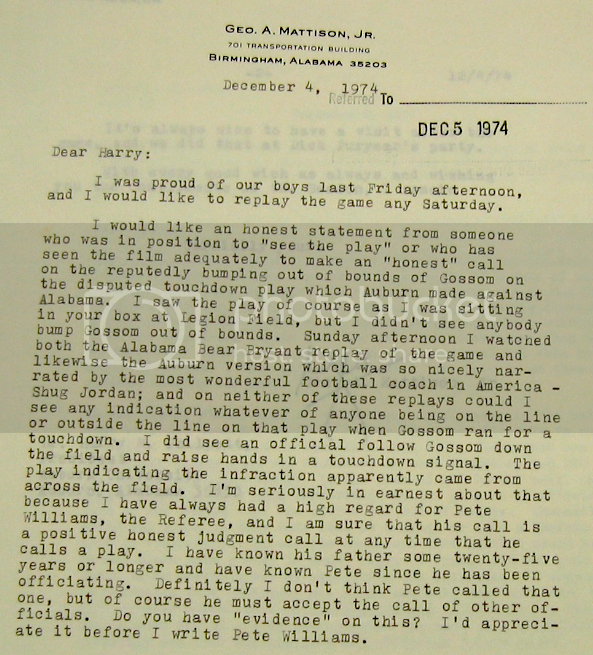 It was captioned “Controversy.” Auburn fans wrote letters. I feel your pain, George. And I wasn’t even there. I wasn’t even born. One play, one game, 40 years ago. It cost us an Iron Bowl. It cost us an Iron Bowl. It cost us an Iron Bowl. Never Forget! If you’d like to help TWER shine the light on even more injustices, click here. I enjoyed this, but I have a question on the editing: How many paragraphs were contained in that first “paragraph”? Makes it really hard to read when it runs on like that. Other than the above quibble, very nice. The 1967 and 1974 games should have a huge ASTERISK in the record books. That happened 40 years ago, and I still remember it- like it happened yesterday.